This unique fringed bag is handcrafted from Pendleton® coat weight wool and premium grade cowhide leather. The front and back of this bag is the same. This bag measures approximately 5 1/4 inches wide by 8 inches tall. The fringe is about 6 inches long making the total length of this bag approximately 14 inches. This bag is sturdy, well constructed, and durable. All inner seams are finished. 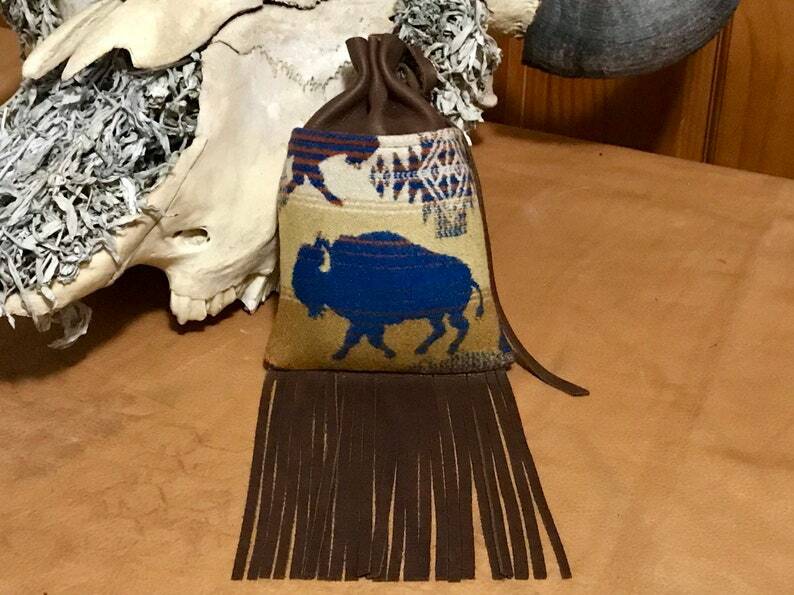 This cedar bag can be used in the sweat lodge, to hold your essential items at sundance or a much appreciated giveaway gift. It is a unique addition to pow wow regalia or you can tie it to your belt for everyday use. These bags can be made as matching sets all the same size, or different sizes depending on your unique needs.